Annual Deductible – in 2018, the allowable deductible is $405. Plans may charge the full deductible, a partial deductible, or waive the deductible entirely. You will pay the network discounted price for your medications until your plan tallies that you have satisfied the deductible. After that, you enter initial coverage. 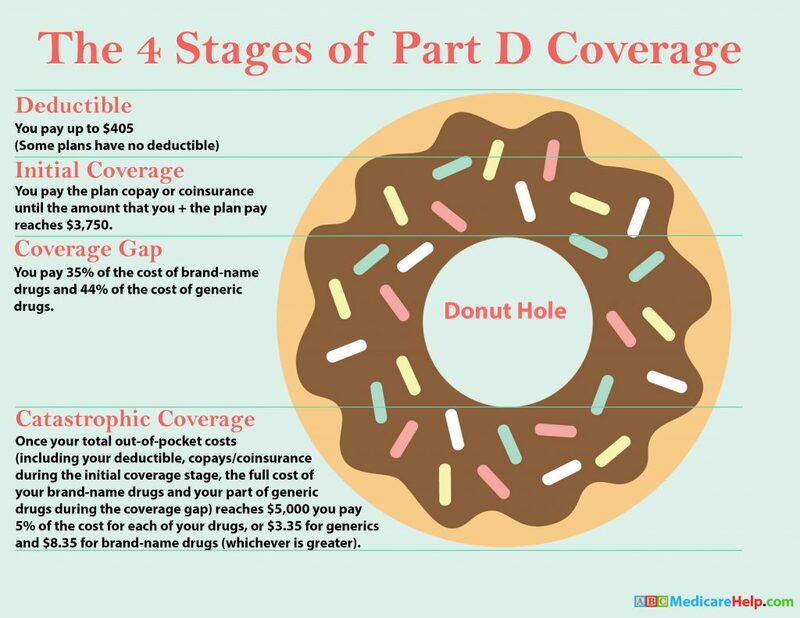 Initial Coverage – during this stage of Part D drug coverage, you will pay a copay for your medications based on the drug formulary. Each drug plan will separate its medications into tiers. Each tiers has a copy amount that you will pay. For example, a plan might assign a $7 copay for a Tier 1 generic medication. Maybe a Tier 3 is a preferred brand name for a $40 copay, and so on. The insurance company tracks the spending by both you and the insurance company until you have together spent a total of $3750 in 2018. The Coverage Gap – after you’ve reached the initial coverage limit for the year, you enter the coverage gap. During the gap, you will still generally have significant discounts for generic medications. You will pay only 35% of your brand name medications, and 44% of generics. (This is so much better than in 2006 when many people had to pay 100% of their drugs in the gap.) Your gap spending will continue until your total out of pocket drug costs have reached $5,000 in 2018. It’s important to note that Medicare itself tracks your True Out of Pocket Costs (TrOOP) for each year. This can protect you from paying certain costs twice. For example, if you pay the deductible on one plan, and then later switch to a different Medicare Part D plan because you moved out of state, your new plan will already see that you have paid the deductible for that year. The costs for coverage gap and catastrophic coverage work the same way.